Facebook recently announced a major change in one of the most popularly in use messaging app namely Whatsapp. Back in 2014 when the social networking giant acquired the messaging application, we were waiting for massive changes and here we get to hear one of the biggest change. This might not sound to be a good news for most of the users out there, but then Facebook has announced to begin sharing Whatsapp users’ phone numbers and usage information with the social network to build out its own business communication platform. It is for the first time that WhatsApp users’ information will be shared with the parent company-Facebook. If you already are aware of the step Facebook is going to take anytime soon and you are dreading this scenario, then, you actually have a reason to celebrate as there’s a way to opt out but only if you don’t delay it any further. 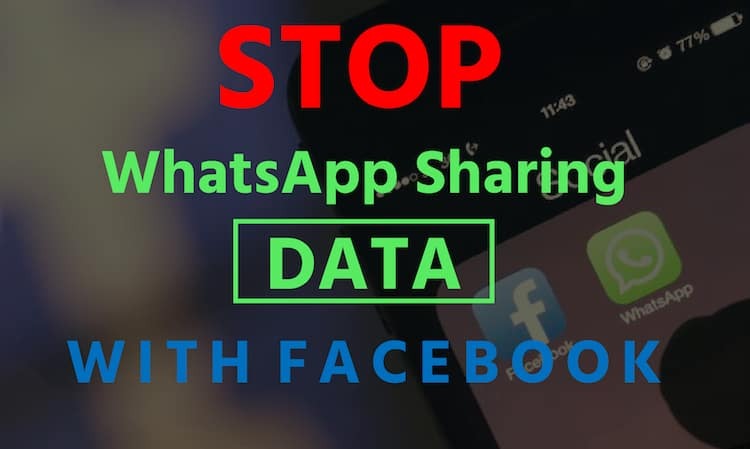 If you follow any of the two listed steps, you can make sure to How to Stop Sharing WhatsApp Data with Facebook on the safer end and believe that your data won’t be misused. WhatsApp is providing users with two ways that they can opt out for. The first step that one can follow is that the very first time you see the new terms of service, don’t agree on the sharing terms. If you miss out on that, then you will have to move ahead and follow the second step. 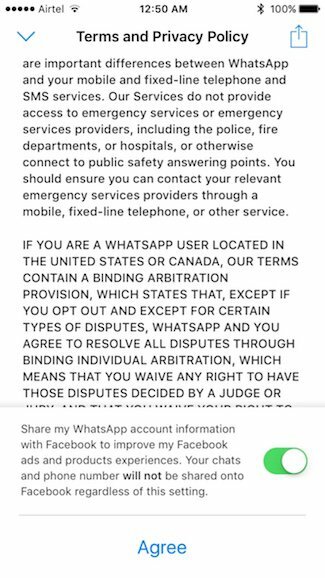 The very first time you see the Whatsapp’s new terms of service on your device, you can opt out there and then. You will get the notification that the terms of service have changed. All you got to do is hit ‘Read‘ to view the full document and scroll down all the way to the bottom where you will get to see a checkbox saying ‘Share my WhatsApp account information with Facebook to improve my Facebook ads and product experiences.‘ Uncheck it and tap Agree’. Simple! Second option comes only if you have missed out the first step. 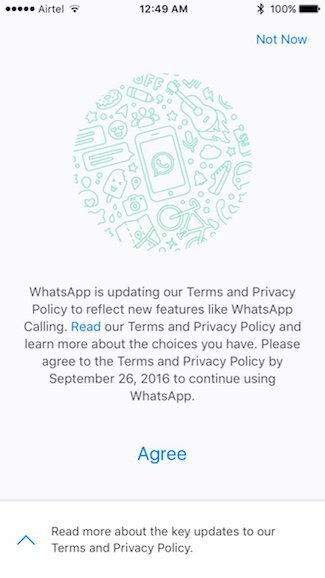 Incase, you have already agreed to WhatsApp’s new terms of service and the account sharing, within 30 days time period, you can opt out. Simply head to Settings>Account and then Share my account info. Uncheck the box and a new dialog will open where you have to click on Don’t Share. 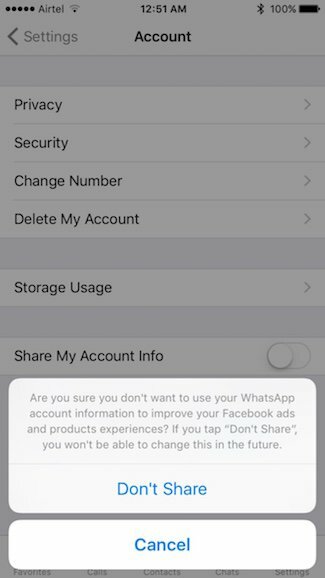 That’s it, you have now stopped WhatsApp from sharing your data with Facebook. Also, for more information and other things related to opting out on WhatsApp. You can check out the FAQ page. 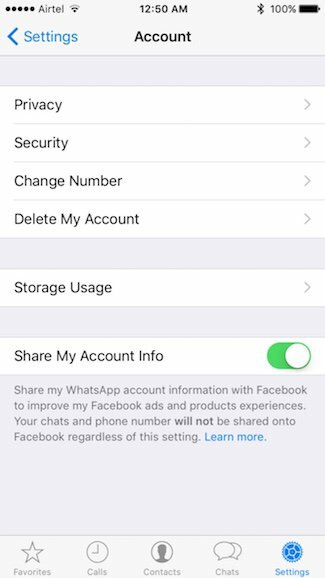 If you are uncomfortable with the idea of your WhatsApp account is linked to Facebook make sure you opt out timely before it is late as there is limited time to do so. See, there is no such assurance that there will be no sneaking up into your Whatsapp account by Facebook completely, but then at least your WhatsApp account can’t be used to surface targeted Facebook ads. If we have more information related to the topic, we will keep you posted. Till then feel free to have your say.